Newfound Regional High School’s Unified Basketball team is learning the different rules of the sport and preparing for a fun season. According to NRHS Sports Page, the team will have four games, one scrimmage, and one jamboree. Miss Burge is coaching the team for its first year, and she and her athletes learned that there are many differences between the unified and varsity rules. These new rules of the sport allow for the unified athletes to play basketball without the constant whistle blowing. The unified basketball teams in New Hampshire are broken down into different divisions based on how competitively the school wants to play. Newfound Unified Basketball team is playing in the competitive division. Miss Burge states, “I really enjoy that my athletes have the ability to be the only ones who are able to score in the competitive division. I think that is one of the main reasons why our team chose to compete in the competitive division.” Not only is Coach Burge happy with the team’s choice in division, but team members Ethan Pruett and Collin O’Donnell also agree. “Because I cannot shoot, I will always be ready on the court to pass the ball to the other athletes,” Ethan explains. Athlete, Faith Smith, said, “I have been practicing shooting baskets at my house, and I’m ready to show my hard work and help others if they need it.” Not only can the athletes score and not the partners, but the referees are more lenient. According to NHIAA’s Policy & Procedure Handbook for Unified Basketball, there is only one required referee. Varsity Basketball requires at least two. The goal of this inclusive sport is to teach the athletes how to play basketball and allow them to participate. Unified Soccer and Unified Track and Field have already been a major success to Newfound. The Unified Athletics Program benefits the school by allowing the students in the special education programs a way to participate in sports, and also allows peer bonds to develop. 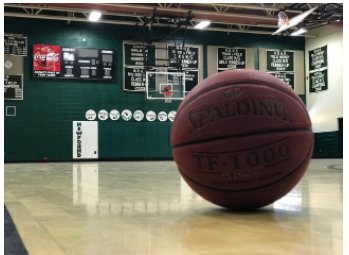 Unified Athletics helps create friendships between students in the building, and NRHS’ unified basketball program will help these relationships continue. Faith states “I personally believe that the team will have a good season if we put effort into having fun and have good sportsmanship towards other teams.” Unified basketball practices occur Tuesdays and Thursdays during fourth period (4C/4D) so that the team can have gym time. Unified Basketball will be having its first home scrimmage on December 12th. The entire schedule can be found on the NRHS athletics page. Please consider coming out to support this new team as they begin their season!